The crew of the Finlander unloads their morning catch at the Pierce Island Co-Op in Portsmouth, New Hampshire. By 4 a.m. every morning the Finlander is out in the ocean, sometimes traveling as far as 50 to 70 miles into the Gulf of Maine, to catch fish to be sold directly to restaurants and customers at local farmers’ markets. The Finlander is a 36-foot Northern Bay and one of two vessels operated by New England Fishmongers. On a good day, Finlander’s crew will haul in 1,000 to 2,000 pounds of fish, according to Capt. Tim Rider. The reason the Finlander usually travels so far out, even beyond the reception of the vessel’s VHF radio, is to increase the odds of catching Atlantic pollock and haddock, instead of a large haul of cod, which has a much higher fishing quota lease price per pound. But out at sea, when the 24-ounce jig is in the water, it’s anyone’s guess what may bite. Despite the risks of fishing on the high seas, Rider’s crew feels a sense of heightened purpose to reconnect local restaurants directly to the fishermen. No member of the crew needs to be reminded of their purpose: They set out each and every morning to bring sustainable change to the fishing industry with every hand-tossed cast. It’s an industry Rider said he believes is bumping up against the threshold of being unsustainable for the men and women actively working in it, if it is not already. Under less burdensome market rules, Monday would’ve made for a great haul for the Fishmongers, according to Rider. By high noon, the Finlander returned to the Portsmouth, New Hampshire, commercial fishing pier with 800 pounds of cod. Rider said after a morning of fishing the crew earned roughly $2,000, nothing to spit at considering they were only fishing for half the day. However, because Rider’s multi-species commercial fishing permit only allows him the ability to catch 103 pounds of cod a year, a quota the Finlander crew can hit in less than a day of fishing, Rider said he is forced to lease additional quota from other fisheries, many of whom are not actively fishing. Since cod quota is leased at between $3.25 and $3.50 per pound, Monday’s big catch is virtually a wash. Rider said he will have to pay about $1,800 earned from Finlander’s catch on Monday to lease quota, leaving roughly $200 to pay his crew for their morning shift and gas up the Finlander. Due to the quota system, Rider said he pays more than half of New England Fishmongers’ annual income to lease quota. He said another problem with the quota system occurred when he agreed to outfit the Finlander with monitoring cameras from environmental conservation organizations to ensure he and his crew were not illegally dumping cod they catch, he did so with the understanding the same organizations that own fishing quota would lease it at a discounted rate. He said the quota relief has yet to be offered to his company. Pat Shepard, sector manager of the Maine Center for Coastal Fisheries, said to better support local fishermen the maximum quota lease price should be capped to reflect the market prices of fish. Chris Pappas, a New Hampshire Executive Council member and Democratic candidate for Congress, joined the New England Fishmongers Monday afternoon to learn more about Rider’s vision for a more sustainable commercial fishing industry. He said he would need to further study the fishing industry as a whole before deciding whether to support some kind of a price ceiling on quota to stabilize local commercial fishing. David Goethel is a commercial fisherman operating out of Hampton, New Hampshire. As a board member of the Center for Sustainable Fisheries, he said he has long advocated for changing the current quota system and this year for all the flounder he caught he was paying 85 cents a pound to lease the quota and was only able to sell it for 40 cents a pound. 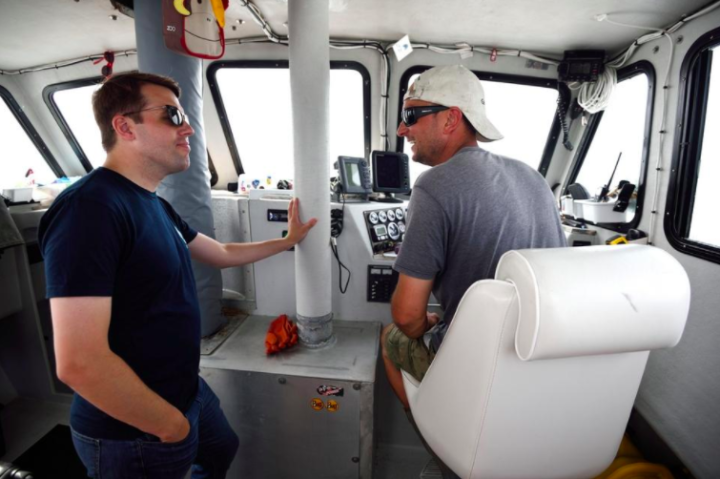 Chris Pappas, a New Hampshire Executive Council member and Democratic candidate for Congress, talks with Finlander captain Tim Rider about the challenges he faces as a fisherman in the Gulf of Maine. Every day when the boat returns, Rider said the job is just getting started for him and his crew. New England Fishmongers’ business model is very much the exception as opposed to the rule, Rider said. He said his dealer fees, licensing fees and maintaining refrigerator trucks and his boats cost him thousands and the costs can be a barrier for other commercial fishermen trying to launch a similar effort. Jeremy Sewall is the chef-owner of Row 34 and Island Creek Oyster Bar, with a Row 34 location in Portsmouth and another in Boston along with two Island Creek Oyster Bar locations in Massachusetts. His restaurant is one of nearly 40 restaurants spread across New Hampshire, Maine, Massachusetts and Vermont that sell New England Fishmongers’ catch, according to Rider. Sewall said he has fresh whole fish delivered by New England Fishmongers to his Portsmouth restaurant and transports fresh fish to his other locations. He said he is able to sell his fish entrees at a competitive price compared to other restaurants who are selling re-imported fish. 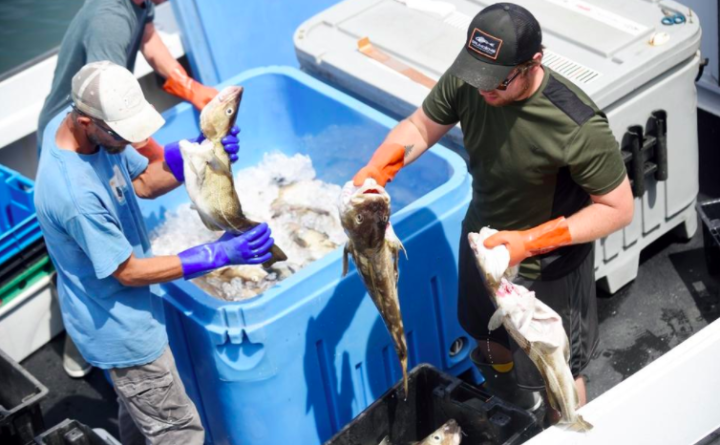 Rider said as much as he and New England Fishmongers are dedicated to remaining “fishermen selling fish,” he acknowledges the economic realities of the fishing industry and having to forgo so much of his earnings just to pay quota leases. Locally, New England Fishmongers fish can be purchased in Dover, New Hampshire, at Tendercrop Farm on Saturdays from 3 to 6 p.m. and at the Kittery Community Market from 10 a.m. to 2 p.m. on Sundays.